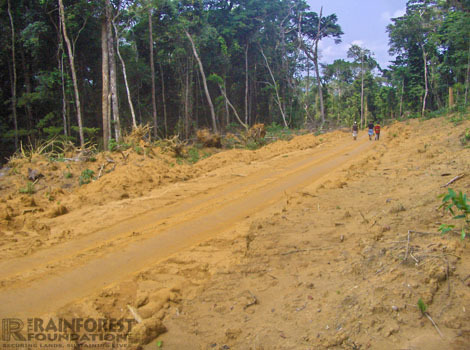 Show the class the picture of a section of the Congo Basin rainforest which has been cleared. Explain that we are going to start an enquiry into why the forest is being cleared or under threat. Look at the picture and write down any questions you have about it. E.g. why is the forest being cleared? Who is doing it? Next show the class the PP slide of the Development Compass Rose and explain the 4 points. Ask the pupils to arrange their questions onto the points of the compass. Are there any other questions they want to ask now? They should add any more questions they have. Review the compass. Do all points have questions? Are some points harder to generate questions for? They can group the questions in different ways for example, those we can find the answers to and those that are more philosophical / harder to answer. Or group them by theme or by local / national / international. Explain that we are now going to explore some of the main issues in more detail using the same enquiry approach. The issues we will explore are: Subsistence agriculture (farming), logging, mining (coltan), bush meat trade (animal/s). NB We will explore the effects on the indigenous forest community in the next activity. In groups, pupils take an issue and, using the development compass rose, generate as many questions as they can. Use the photos as a stimulus. Pupils can use this as a starting point to research the issues further. See below for useful websites. Pupils might also feel inspired to take action around some of these issues. See the active global citizens section for ideas. Are some areas easier to ask questions around than others? Can you group the questions into ones you can find answers for and some that you can research? How does the compass rose help you to think more widely? Does this change your thinking on (sustainable) development again? If you want you can return to the statements from the activity forest clearance past and present again and see if your opinions have changed / developed. Remind the pupils about the reasons for forest clearance in Scotland's past. Are there any similarities in the reasons for forest clearance in Scotland and in the Congo Basin? Who has the power to decide the fates of these forests? Are there similarities between these groups? There are no easy solutions to the problems facing the Congo Basin rainforest. It is a very poor part of the world and the countries with forests need money to be able to provide a better quality of life for the people who live there. Logging is an important source of jobs for local people and money for the government. 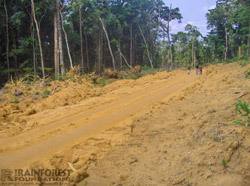 However, logging needs to be done in a sustainable way so the forests can regenerate. In the same way, mining operations, hunting for bush meat and agricultural development all need to be regulated to ensure that the rights and needs of all forest users are taken into account. However, these are complex issues and people hold different views depending on how they are connected to and affected by the issues.